It was the anti-gun tirade that belied the southern rock kingpins’ pistol-packin’ image. Except things weren’t quite that black and white. In art, as in life, some things are not always what they seem. So it is with the song that gave Lynyrd Skynyrd a US Top 30 hit in 1975. The song in question has always been perceived as an anti-gun protest song. Actually it’s more complicated, more nuanced than that. Saturday Night Special was a protest song with a caveat. In the words written and sung by Ronnie Van Zant, the leading figure in the band’s first great era, there was a question that went to the heart of America’s gun culture: ‘Why don’t we dump ’em, people, to the bottom of the sea?’ But the truth was that Ronnie Van Zant was no anti-gun campaigner. 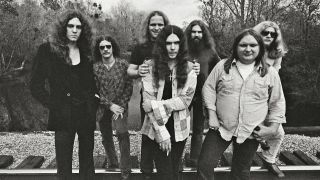 Forty years after Saturday Night Special was released, and 38 years since the plane crash that killed Ronnie and five other members of Skynyrd and their entourage, only one member of the seven-man line-up that recorded this song remains in the band: guitarist and co-founder Gary Rossington. Guitarist Allen Collins, bassist Leon Wilkeson and keyboard player Billy Powell have passed away. Drummer Artimus Pyle left the band in 1991. Ed King, the guitarist who wrote the music for Saturday Night Special, left for the second and final time in 1996. For Rossington, Saturday Night Special is one of the definitive Skynyrd songs. “One of our very best,” he says. For Johnny Van Zant, Ronnie’s kid brother, who became Skynyrd’s singer when the band reunited in 1987, it’s a song both prophetic and poetic. Once the song was written, the band recorded it immediately at the behest of their record company MCA. That summer, Skynyrd had notched up a Top 10 hit with Sweet Home Alabama, and label execs were keen to cash in on that success. Saturday Night Special was recorded quickly so it could be included in the soundtrack to the 1974 film The Longest Yard, a comedy about a prison football team, starring Burt Reynolds. The track was recorded in a single day, between gigs, at Studio 1 in Doraville, Georgia, where Skynyrd had made their first two albums. It was their first recording with drummer Artimus Pyle, who had recently joined the group in place of Bob Burns. According to Rossington, all of the group were more or less straight while they were working on the track. Skynyrd had a well-earned reputation as a hard-drinking, hard-partying band, but in the studio they reined it in a little. What Skynyrd created with Saturday Night Special was a track as heavy in its sound as in its lyrics. Much of its force came from Artimus Pyle. “I was hittin’ that snare as hard as I could,” the drummer later recalled. The three guitarists – Rossington, King and Collins – played off each other brilliantly. But it was Ronnie Van Zant, more than anybody else, who made it so powerful, with what he said and the way he said it. There were no histrionics. That was never his style. But in his measured delivery was the cool authority of a man who always spoke the truth as he saw it. Saturday Night Special was released as a single in May 1975, nine months after it was recorded. It was the lead track on Skynyrd’s third album, Nuthin’ Fancy, released two months previously. Many years later it would also feature in the 2005 remake of The Longest Yard, in which Adam Sandler took the Burt Reynolds role, and Reynolds himself played a different, older character. Lynyrd Skynyrd still play Saturday Night Special at almost every live show. “It’s a song that we all love,” Johnny Van Zant says. “And I think it’s more relevant now than when Ronnie wrote it. When I was just a kid, growing up, we always had guns around our house. My family, we were hunters. But handguns scare me because I know there’s only one thing they’re gonna be used for. In 2015, the issue of gun control has once again been debated across the US in the wake of shooting tragedies in** **Oregon and Tennessee. For Gary Rossington and Johnny Van Zant, like many Americans, the subject of gun control is a complex issue. “I’ve got guns myself,” Van Zant says. “I live in the swamps of Florida, there are water moccasins and rattlesnakes around, and I want to kill those things if they’re on my land. And if somebody breaks into your home at four in the morning, you want to be able to protect your family. So I own a Winchester rifle, and I’m not giving that up, you know?